#Syria - Barrel bombs filled with chlorine gas was dropped on al-Sukari neighborhood in #Aleppo. 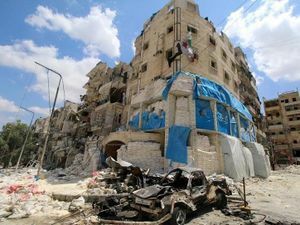 At mid-day on September 6, 2016, it was alleged the Syrian government again dropped a chlorine-dispersing barrel bomb on civilians, this time in Aleppo's rebel-held Sukkari neighborhood. Over 100 were said to be affected by the gas, with two people dying from it and/or injuries from impact. Al-Sukari district is located in the south-west of Aleppo, bordering Ramouseh where the "rebel" corridor was closed (again) by the SAA on September 4th (on wikimapia). This makes it a proximate front-line area, where government offensives might be planned soon, for example. 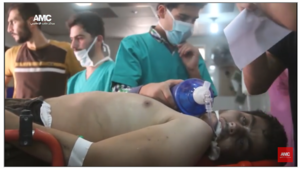 The attacks also comes about one week after the UN-OPCW joint investigative mechanism released its interim report blaming Syrian forces for chlorine attacks by helicopter, back to 2014. 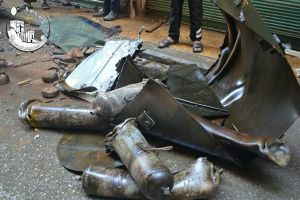 The Syrian Network for Human Rights (SNHR) heard the attack was "around 1:30 PM," and the relevant barrel landed "near “Wafaa Kharsa” pharmacy in Al Sukkari neighborhood." It was also apparently near a public market. Most first day reports didn't mention any deaths, but reports of fresh airstrikes the next day, killing at least 10, had chance to mention two delayed fatalities. Mohammed Abu Jaafar, head of the local forensic department in the rebel-held part of Aleppo, said on Wednesday that the girl died overnight of suffocation and respiratory burns. Note: There are no "fascial bones." Fascia runs bodywide under the skin and has no bones. (Wikipedia). But there are facial bones. So to clarify, her breathing was complicated by a smashed face, caused by the physical barrel bomb impact/blast or after effects (or so it's being reported). But the actual chlorine killed her, realistically, as described. Clearly, video confirmation in this case would be unpleasant. The AP dispatch mentions "A 29-year old man also died from respiratory failure." British ITV news was told the male victim was Mohammad Abdulkareem Afefa, age 29. SNHR: "We documented the killing of one individual, Mohammad AbdulKarim Afifa"  A man of perhaps this age, unresponsive and perhaps dead, appears in a video of he 6th (chlorine indicator on him seem absent - see Talk Page). The same man is seen in an Aleepo Media Center photo (here on Facebook), clarifying he has white foam in his mouth and left nostril (still not very indicative of chlorine). The opposition VDC database lists only the girl: Hajar Kayali, child-female, from Sukkari neighborhood, killed Sept. 6 by government forces using chlorine gas. a tweet in Arabic from 3:28 pm Syria time on the 7th, saying the girl "هاجر كيالي" had died (auto-translated) "after chlorine gas delivered by Syrian helicopters on diabetic (Sukkari) district yesterday"
Syria Chlorine Allegations: Sept. 6 Fatalities Seen on Video? Monitor on Massacre Marketing (ACLOS affiliated). This examines the imagery of the two likely victims, finding neither seems to have been exposed to significant amounts of chlorine, and probably died from something else. Al-Quds hospital in April 2016, after it was hit by airstrikes. second chlorine gas attack on Sukari #Aleppo in 2 months by Assad army. 80 suffocation cases reported. وصول حوالي 80 اصابة بغاز سام الى مشفى الشهيد باسل اصلان بعد استهداف حي السكري داخل #حلب بقذائف تحتوي على غاز الكلور. 80+ civilians suffocating now from Assad regime chlorine bombs in Aleppo. Another chemical attack... #HowManyMore? Pictures posted on social media show wheezing children using oxygen masks to breathe in an Aleppo hospital. The report and pictures could not be independently verified and it was not clear how the activists determined that chlorine gas was released. This page was last edited on 17 October 2016, at 11:37.